In a recent Kickstarter update GrowlerWerks mentioned that they had been served with a patent infringement lawsuit by Drink Tanks, another pressurized growler company. I thought it would be interesting to examine the technical aspects of this patent dispute between two local Oregon growler companies. In November 2015, Drink Tanks filed a lawsuit with the United States Federal Court in Deleware, claiming that the GrowlerWerks uKeg infringes their patent. Both companies completed successful Kickstarter projects for CO2-pressurized growlers for storing, preserving, and dispensing beer. Disclaimer: In examining this case I will be providing some of my own opinions and thoughts regarding the lawsuit. I am by no means a legal expert, and any opinions should be taken as such. In March of 2013, a Kickstarter campaign for Drink Tanks was launched creating one of the first pressurized growlers on the market. A month later, the campaign closed with $236,772 in funding and 1,959 backers. Two years later, they launched a second campaign for the Kegulator Cap and The Juggernaut 128 oz. growler. This time they raised $304,142 with 2,076 backers. Almost a year later, Drink Tanks purchased a $1.64 million dollar, 17,250 square-foot facility in downtown Bend, as they had outgrown their previous building and needed more room. However, not all was going seamlessly at Drink Tanks. A recent Kickstarter update indicated they have been “unable to get consistent results” from their recent batch of Kegulator caps. Some of these delays have been caused by of manufacturing issues and tooling changes. On October 15, 2014 GrowlerWerks launched their Kickstarter for the uKeg; on December 7th they successfully funded their campaign with over $1.5 million dollars. Since, then the GrowlerWerks team has had some scaling issues as well, varying from production issues to product refinement, while still trying to fulfill rewards for over 10,000 backers. GrowlerWerks’ recent Kickstarter updates indicate they continue to ship out uKegs to their Kickstarter backers. However, they have had to do so at a reduced rate, selling to retail outlets in order to fund their pending lawsuit. I attempted to contact Drink Tanks CEO, Nick Hill, in order to get his side of the story for this article. Unfortunately, I was told Drink Tanks could not comment on active litigation. I also reached out to GrowlerWerks CEO, Shawn Huff, and he agreed to discuss the issues with me. He was also able to direct me to some of the publically available court documents and patent office filings. In speaking with Huff, he is unclear about what specific part of the patent the uKeg allegedly infringes. The court documents do not specify which claims of the patent are being infringed, only that there is a claim of infringement. One of the main things I got from our conversation is how unexpected this lawsuit was to him. After receiving the lawsuit, Huff said he called Drink Tanks CEO Nick Hill and tried to discuss the issue since the two were on friendly terms. Hill had visited with the GrowlerWerks team at both the Craft Brewers Conference and Great American Beer Festival, where they were both exhibitors and there was no mention of a lawsuit. Shawn said Hill never returned the call, but he did get a call from Hill’s lawyer, indicating he would speak with him. Huff then set up a meeting through the lawyers in Bend, but explained Drink Tanks cancelled before the meeting took place. In my experience, most people in the craft beer industry are very friendly and want to help each other out. While Drink Tanks is entitled to file this lawsuit, it seems to go against the spirit of craft beer by not trying to work it out before going straight to litigation. The following is a brief timeline, setting up an order of events for the patent litigation that will be explained further. 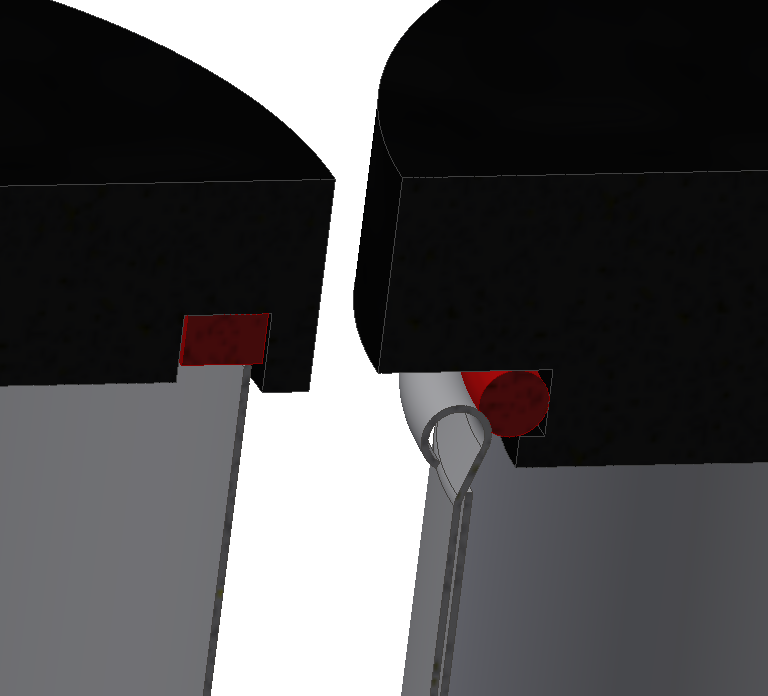 Drink Tanks files first provisional patent. Drink Tanks Launches their first Kickstarter with the DrinkTank and KegCap. Drink Tanks files full patent application. GrowlerWerks founders come up with idea to make a new pressurized growler after drinking flat beer from a glass growler. GrowlerWerks researches pressurized growlers and finds many products already being sold. So they purchase one of each and decide none really meet their requirements, and begin designing their own. GrowlerWerks applies for first provisional uKeg patent application. GrowlerWerks launches Kickstarter aware of the Drink Tanks original patent, the next day, Drink Tanks files for an expanded continuation of their original ‘959 patent. USPTO grants Drink Tanks original patent US 8,887,959. 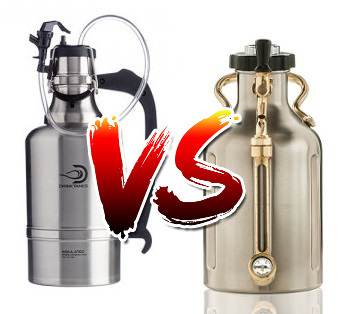 Drink Tanks launches second Kickstarter for 128oz Juggernaut Growler and Kegulator. GrowlerWerks files full patent application for uKeg. Drink Tanks files a complaint against GrowlerWerks with Federal Court in Delaware, stating the uKeg is infringing on their newly broadened ‘670 patent. *GrowlerWerks, not knowing about the continuation until they were sued, were obliged to reference the ‘670 patent in their USPTO application. Patent applicants are required to provide all relevant references they know about up until the point that the USPTO issues the patent. The patent examiner did not reject the application based on the reference and the patent was granted. The USPTO has a process called re-examination to reevaluate patents that may have been granted in error. GrowlerWerks claims that the patent examiner made a mistake and granted IP for technology that was already in the marketplace. GrowlerWerks submitted a petition for IPR (Inter-Partes Review), which is to correct an oversight by the patent office. The exclusion of these patents in this section indicates the examiner was not provided with them as prior art and did not find them in his review during examination of the continuation. Additionally, not only are none of these relevant applications cited, a large portions of the citations are in reference to cryogenics or other non-beverage container patents. When submitting a patent application the inventor makes a claim or claims, describing what they have invented and what is new and novel about it. For a patent to be patentable it must meet the criteria in United Stated Code (U.S.C.) Section 35, portions of which are paraphrased below. These are not the only requirements for a patent to be granted, but they are the major sections that are frequently cited in cases like this. 35 U.S.C. §103 – Non-obvious - cannot be obvious to combine well-known parts. 35 U.S.C. §112 – Enabling description - Must contain a written description of the invention and the manner and process of making and using it. The Drink Tanks litigation claims GrowlerWerks has infringed their intellectual property. 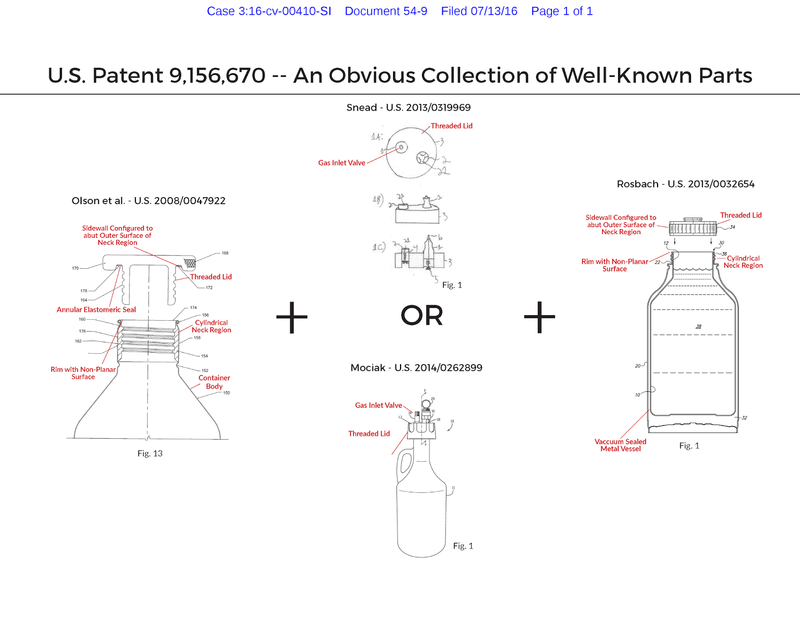 To counter their claim of infringement, GrowlerWerks has submitted a patent re-examination request, which asks the USPTO to take another look at the claims in the Drink Tanks continuation. If some of the Drink Tanks claims are found to be invalid by the re-examination, then the claim on infringement could be substantially narrowed. The following prior art summary, attached with one of GrowlerWerks’ court filings, briefly describes GrowlerWerks argument that Drink Tanks should have never been issued the continuation. The text in red is specific pieces of the Drink Tanks independent patent claims, GrowlerWerks asserts is prior art. Those sections are then superimposed over four previously existing patents. I have also underlined the sections unique to each claim. A beverage storage system comprising: a container body comprising a vacuum sealed metal vessel having a rim which has a non-planar surface, a lid having a threaded portion and a gas inlet valve; and an annular elastomeric seal interposed between a bottom surface of the lid and the rim and configured to seal against the non-planar surface of the rim. A beverage storage system comprising: a container body comprising a vacuum sealed metal vessel having a rim which has a non-planar surface, a lid having a gas inlet valve; and an annular elastomeric seal disposed in an annular channel in the bottom surface of the lid and configured to seal against the non-planar surface of the rim; wherein the container body includes a generally cylindrical neck region and the channel includes a sidewall configured to abut an outer surface of the neck region. This diagram describes the Drink Tanks system as a combination of a rim sealing lid, integrated with a GrowlerSaver, on top of a HydroFlask. There are also a variety of pressurized growlers on the market such as the Brauler (another Portland Kickstarter company), ManCan, TrailKeg, iKegger, and CO2 Mini Beer Tap Head System. Combining multiple obvious technologies does not warrant a new patentable technology. Combining multiple patents does not warrant a new invention, sections of these patents even mention combining them. The first claim (1), if you remove the part about the gas inlet valve, comes pretty close to describing the HydroFlask. Drink Tanks uses the same seal type used on the HydroFlask, which was available long before Drink Tanks. The threaded portion seems to be worded slightly ambiguously. The implication being that the cap could be threaded or the gas inlet valve could be threaded; neither being a new invention. The next difference describes the “sidewall configured to abut an outer surface of the neck region.” This seal design is not new and also one Drink Tanks does not use. The seal used by Drink Tanks is the same as HydroFlask, a square o-ring sandwiched between the bottom of the lid and the top of the growler rim. The difference being HydroFlasks have a screw top and Drink Tanks use wire bales to generate seal pressure. The uKeg uses a round o-ring, a style of o-ring that is commonly used on beverage containers, dating back to the first vacuum insulated Thermoses®. It is a very generic and widely used method of sealing liquid vessels (e.g. travel mugs.) I took a picture of a Contigo® travel mug, Fifty/Fifty® growler (also from Bend), and the uKeg’s lid o-ring. They are all vacuum insulated and use a round o-ring to seal on the inside of the vessel. At the end of the day I believe this comes down to the USPTO granted intellectual property rights to Drink Tanks which it did not own. GrowlerWerks has asked the patent office to do a re-examination and included all of the readily available prior art demonstrating all aspects of the Drink Tanks patent were pre-existing on the marketplace prior to the application. The re-examination will then allow the USPTO the necessary information to correct the oversight. A patent was mistakenly granted when Drink Tanks claimed they invented pre-existing technology. The USPTO must decide by December 7th, 2016 if they will institute the inter-partes review based on GrowlerWerks’ petition. In the case that they do not institute the IPR, the federal court case will determine if the patent and infringement claims are valid. Disclosure: I did participate in the GrowlerWerks Kickstarter campaign and pledged for a uKeg64. Cheers for the article and mention. Thanks Dave, I thought it was a pretty interesting case. From David Thackray's comment am I to understand that iKegger is also being sued by Drink Tank? If so I feel your pain David! Thank you for all the work you put in to this. It is clear to me, an untrained observer, that all the component parts were pre-existing and Drink Tanks just got beat by a better design. Great analysis. Like you said, the original lawsuit didn't specify what exactly was being challenged. This is a seemingly baseless infringement lawsuit, and I hope that Drink Tanks loses their patent for this BS. I am a Ukeg backer, still waiting for my 128. Fantastic overview! I've been searching for updates on this issue and haven't been able to fin anything new. Do you have any updates on this? It's past the December 7, 2016 deadline for the USPTO to institute the IPR. I contacted Shawn Huff and he said the patent overview has been extended into next year as they are backlogged. Still no firm date on when they will be making a decision. Well, technically the IPR was denied by the USPTO due to something about filing deadlines; however GW has filed another IPR that is yet to be processed by the USPTO, and its believed that this should solve the filing issue. The USPTO did refrence the 2nd filing in the ruling to deny the first one and said the final descision will be based on the 2nd filing. In any case DT made the case the whole IPR was invalid as they had failed to establish valid arguments against their patent; and from the wording I think the DT complaint could hold water even if their patent really shouldn't. So at best saying its been extended into next year is at best a half truth - which is the best you'll ever get from GW anyway.. I'm just praying to the beer gods they manage to ship all the kickstarter rewards before the ship sinks. Ya. I'm very grateful I got my GW. I made sure to buy a bunch of spare parts in case the ship sinks. The Patent Trial and Appeal Board found that "that claims 1–7, 9–13, and 16–19 of U.S. Patent No. Drink Tanks filed a notice of appeal.